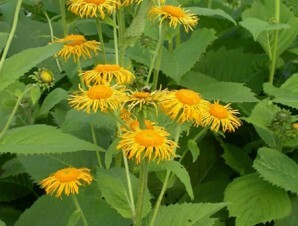 I. magnifica has large triangular felty light green leaves from which emerge flowering stems reaching to 3 metres, covered with large yellow daisy flowers in July. A great plant, too big for small gardens but good at the back of a deep border. Categories: Autumn, Featured Plants, I-L, Plants A-Z, Plants by Season, Plants In Situ, Summer, The Hot Border. Truly magnificent where there is room to show it off from top to bottom and where it will not be battered by strong winds. Rough textured leaves, not unlike dock leaves but far larger, arching and toothed edged, make a handsome pile. 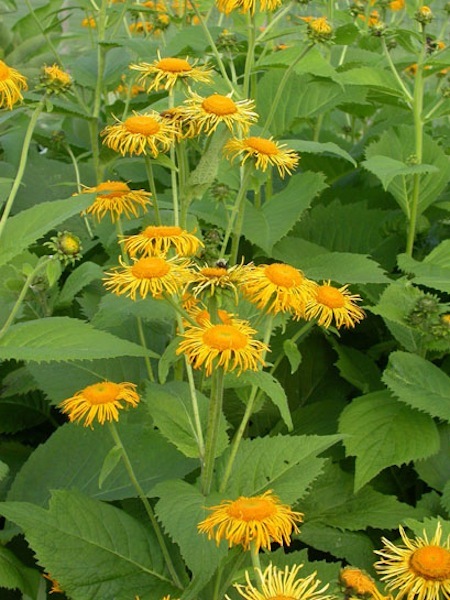 They ascend stout stems in diminishing size to wide branching heads of flower, large, fine-rayed yellow daisies. Splendid in rough grass in retentive soil, or by the waterside. Aug.-Sept. 2-2.5 m.